Department : Computer Science and Engineering. Area of Interest : Grid Computing, Ad-hoc & Wireless Sensor Networks, Data Warehousing & Mining, Big Data, Computer Networks, Software Engineering, Compilers, Theory of Automata, Distributed and Cloud Computing..
2 Worked as Assistant Professor, Dept. of CSE, JNTUCE, Kakinada form Nov 2006 to Jan 2009. Dr. K. Shahu Chatrapati, "Competitive Equilibrium Approach for Load Balancing a Computational Grid with Communication Delays", Journal of Theoretical and Applied Information Technology, 19(2), pp.126-133, 2010. Dr. K. Shahu Chatrapati, "Competitive Equilibrium Approach for Load Balancing a Data Grid", International Journal of Computer Science Issues, 8(2), pp.427-437, 2011. 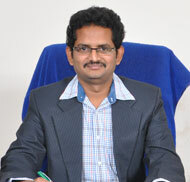 Dr. K. Shahu Chatrapati, "Game Theory and its Applications in Computer Science" accepted for publication in International Journal of Recent Trends in Engineering & Technology, Nov 2011. Dr. K. Shahu Chatrapati, "Multipath Interference Minimization in Heterogeneous Wireless Sensor Networks for Reliable Data Transfer", IEEE 6th International Conference on Computers and Communication Engineering (ICCCE 2016), Kuala Lumpur, Malaysia, July 25-27, 2016, IEEE CPS, pp 261-266. Dr. K. Shahu Chatrapati, "Interference Minimization Protocol in Heterogeneous Wireless Sensor Network for High Quality Data Transmission" International Conference on Innovations in Computer Science and Information Technology (ICICSIT-2015), MGIT, Hyderabad, 2015. Dr. K. Shahu Chatrapati, "Competitive Equilibrium Approach for Load Balancing in Computational Grids", In the Proceedings of the International Conference on Advances and Emerging Trends in Computing Technologies (2010). Dr. K. Shahu Chatrapati, "Recursive Competitive Equilibrium Approach for Dynamic Load Balancing a Distributed System", In the Proceedings of International Conference on Distributed Computing and Internet Technologies, LNCS:6536,162-174, 2011. Dr. K. Shahu Chatrapati, "Competitive Equilibrium Theory and its Applications in Computer Science", In the Proceedings of International Conference on High Performance Architecture and Grid Computing, CCIS: 169,539-547, 2011. Dr. K. Shahu Chatrapati, "A Study on Load Balancing in Grid Networks" accepted for publication in the Proceedings of 2ndInternational Conference on Swarm Evolutionary and Memetic Computing, 2011. K. Shahu Chatrapati, "Preventive and Dynamic Control of Traffic on ATM Like Networks, In the Proceedings of the national conference RTCNC 2006. K. Shahu Chatrapati, "Secure Authentication Transit Of Data Transfer Over Network Using High Speed RSA Algorithm Thru Mobile Communication, In the Proceedings of the international conference on Emerging Technologies and Applications in Engineering Technology and Sciences (ICETATES 2008). Ph. D Thesis Submitted by K. Anil Kumar on "IMCC Security Mechanism in Heterogeneous Wireless Sensor Networks for High Quality Data Transmission" Jawaharlal Nehru Technological University, Hyderabad, Dec 2016. Supervising 8 Research Scholar in the fields of Wireless sensor Networks, Data mining, Grid Computing and Network Security. Many research projects are being handled at post-graduation (ME/ M.Tech) and under-graduation (BE/ B.Tech) Engineering Level. 5-Day Intensive course on "PHOENIX IR TRANFORMATIONS" at IIIT Hyderabad from 4/12/2006 to 8/12/2006. TEQIP Sponsored workshop on "Data Warehousing and Data Mining" at Dept. of CSE, JNTUH CE, Kakinada, from 8/9/2007 to 9/9/2007. One day National workshop on "UbiComp India 2008", organized by CDAC, Hyderabad and R&D, Department of Information Technology, Government of India, on 5/09/2008. UGC Sponsored Refresher Course on "Information System Security", ASC JNTU from 9/11/2009 to 30/11/2009. Delivered Guest Lecture on Theory of Computation at Dept. of CSE, Swarnadhra College of Engineering, Narspuram. Delivered Guest Lecture on Compiler Construction at Dept. of CSE, Kakinada Institute of Engineering and Technology, Kakinada. Life Member, "Computer Society of India". Life Member, "Indian Society for Technical Education". Session Chair, IEEE 6th International Conference on Computers and Communication Engineering (ICCCE 2016), Kuala Lumpur, Malaysia, July 25-27, 2016. Advisory Board Member, Springer, International Conference on Computer and Communication Technologies, IC3T 2015, CMR Technical Campus, Hyderabad, 2015. Advisory Board Member, DST Approved NCCSIGMA-2K16, CMR Technical Campus, Hyderabad, 2016.